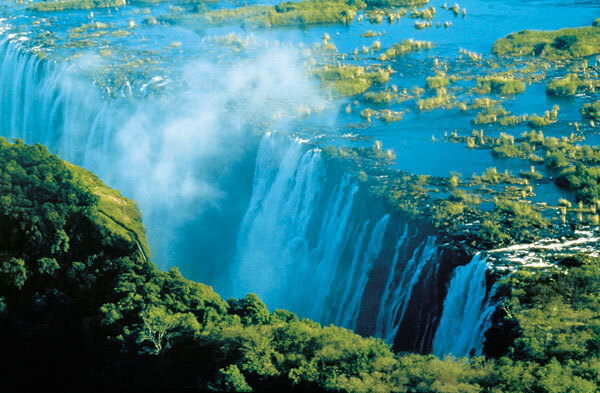 Victoria Falls, or Mosi-oa-Tunya (Tokaleya Tonga: the Smoke that Thunders), is the great waterfall in southern Africa on the Zambezi River at the border of Zambia and Zimbabwe. The Falls is one of the world’s three large waterfalls and a sight not the be missed. Believed to have discovered by David Livingstone the Scottish missionary and explorer, the falls were named after Queen Victoria. A “must see” destination for nature lovers, the Falls boast boutique hotels and sophisticated resorts to satisfy all tastes and budgets. Victoria Falls is a playground of thrills: elephant back safaris, canoeing, white water rafting, bungee jumping, helicopter flips, game viewing on horseback … to name just a few! 2 nights first class accommodation, breakfast daily, airport transfers. Sundowner cruise and guided tour of the Falls.